✓ COMES IN 2 DIFFERENT SIZES – This set includes 1 extra large bamboo cutting board which measures 18 in x 12 in x 3/4 in and 1 small bamboo cutting board which measures 8 in x 6 in x 3/4 in. ✓ GREAT FOR FOOD SAFETY – High-quality cutting boards & serving trays made from 100% premium bamboo with no added dyes or stains which is toxin free and has natural anti-bacterial properties. ✓ DURABLE AND CAN HANDLE JUST ABOUT ANY JOB IN YOUR KITCHEN – Our cutting boards and serving trays are made from premium bamboo which resists knife dulling and warping. It’s thick and durable so they can meet your kitchen cutting needs. The extra large size provides enough space for heavy-duty vegetable chopping, slicing fruits, and cutting meat while the smaller version provides space for preparing and serving cheese, crackers, fruits, & small kitchen cutting jobs. ✓ VERSATILE & NO MESS – Reversible makes for a great chopping board, cheese board, or epicurean cutting board. It has a juice and drip groove which keeps liquids on the board and not all over your counter. There are kitchen cutting jobs that require more space than the regular boards and there are also ones that need just a tiny portion of your countertop. 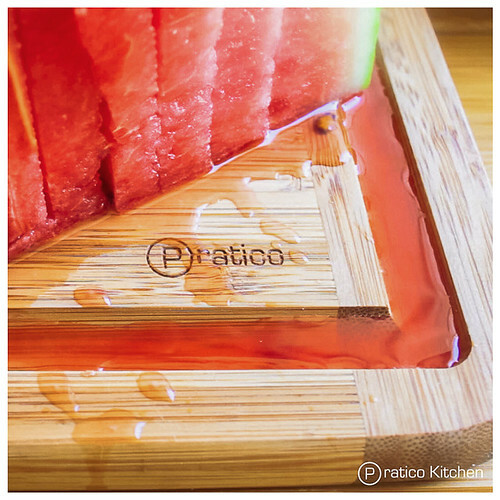 So to ensure all of your kitchen cutting requirements will be met, Pratico Kitchen offers Pratiboard Bamboo Cutting Board and Serving Tray Set that includes not just one, but two chopping boards with different sizes. It’s definitely a perfect addition to your kitchen essentials! ✔PREMIUM CONSTRUCTION AND BAMBOO -Professionally manufactured wood made from 100% premium eco Moso bamboo that ensures optimum quality. ✔ SET INCLUDES 2 DIFFERENT SIZES -Comes in two different sizes; one extra large which measures 18 in x 12 in x 3/4 in and 1 and weighs 3 lbs and one smaller version which measures 8 in x 6 in x 3/4 in. This will ensure all of your kitchen cutting requirements shall be met. ✔GREAT FOR FOOD SAFETY -Bamboo is naturally antimicrobial and because it is less porous it prevents bacteria from forming. ✔MULTIPURPOSE & MESS-FREE -Reversible surfaces allow you to use them as cutting boards, cheese boards, or serving trays. Plus, these boards feature extra large juice and drip groove which keeps fruit, meat, and vegetable juices on the board and not on your countertops. ✔EASY TO CLEAN AND MAINTAIN -Wash with warm water and soap and air dry. Periodically rub with mineral oil to prolong life. Add the Pratico Kitchen Cutting Board and Serving Tray Set to your shopping cart now and start enjoying the benefits of bamboo today!